I was driving to the ICE detention facility in Aurora today when looking off to the left, I saw what I assumed was a fire. 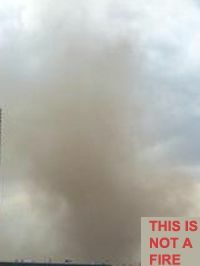 I considered for a brief second it could be a tornado, but it wasn't raining and it didn't seem to be twirling, it just looked like dirty smoke. So I kept going. Within a minute there was lightening. Then I could hear a little bit of hail fall on the roof of my car, then a siren went off in my car (my cell phone was plugged into the stereo, and the siren was as loud as the radio when the volume is turned up really high. I didn't even have the radio on, let alone set at high volume.) It was an emergency alert -- which I hadn't signed up for but appreciated -- telling me to get out the area, a tornado had been spotted "in rotation" on radar. I had no idea what "in rotation" meant, but I understood I should get out of the area.